Ok, so, for a completely off-topic post about a car. 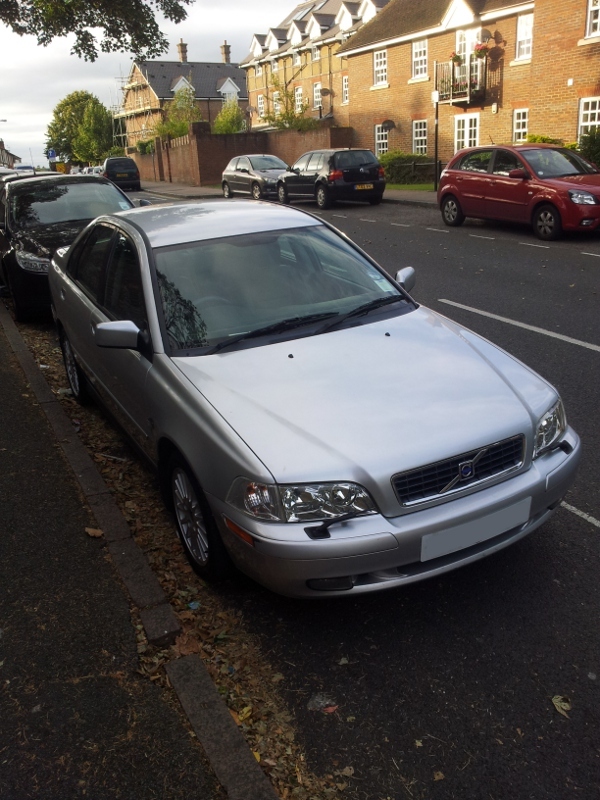 I bought a 2002 Volvo S40 SE 2.0 Automatic a few weeks ago for family day trips etc and not commuting. So I wanted something cheap, comfortable and safe. This car seems to pretty much fit exactly, so much so that I thought I'd share some of the things I like about it. Perhaps you are in a similar situation and are considering buying a second-hand Volvo. For long day trips or weekends away this is quite important. Bouncing down the motorway in a old Fiesta isn't exactly comfortable. So, what does my car give me? Climate control - Not just aircon, but proper climate control. Set it to AUTO, choose a temp and voila. Automatic - Not to everyone's taste, but I'm kinda liking it. Makes traffic jams bearable. Cruise control - Haven't used it yet, but nice idea for those long motorway journeys. Adjustable dashboard light brightness - Nice little touch. CD and tape player - CD player is a requirement, and the tape player is even handy for playing mp3s or Spotify from my phone. 2.0 Engine - Car is pretty responsive. Heated door mirrors - Again, too warm to have used them yet, but will come in handy later. The most important thing as a family man is of course safety. Side markers - Little orange lights on the sides of the car at the front and back to help visibility of the car from the side. Required in North America but not in Europe, I didn't see a single other car last night with them whilst walking in town. Headlight wipers - Not only do they look kinda cool, but sort of handy. Driver and passenger airbags - The basics. Side impact cushions - A nice extra little touch, adding to safety. 4 star Euro NCAP rating - "The S40 was awarded four stars for protection in frontal and side impacts, the only one of 13 family cars tested to achieve this result"
The idea was to get a car that was big enough for day trips without being too big for the terrible on road parking where I live. Parking voucher clip - Silly, but very cool. A little clip on the right of the windscreen to place parking vouchers etc. Handy, really handy and a nice little touch. Boot size - 415 litres, big enough to put the pram base in without taking off the wheels. Lots of random storage - Little storage spaces throughout the car. Cup holders in central arm rest - Another nice little touch. Full electric windows with driver-side control - All four door windows are electric. Leather seats - Easy to clean and spill friendly, perfect for kids in the back. Finally, and not in any particular category, awesome advice from the excellent community at volvoforums.org.uk.